Piecing together seemingly impossible puzzles is intriguing to Wright State University computer science major Jacquelyn Smith. So when she interned with the FBI last summer, a new career path suddenly opened up to her. “With the FBI, I knew they handled a variety of work and that there would be more computer-related opportunities because of how much cyber has begun to affect everything,” said Smith, a junior. The FBI’s cyber division predicts and counters potential threats to America’s digital infrastructure. In addition to recruiting the most talented computer scientists in order to deconstruct the malicious code involved in cyber-attacks and develop counter-intrusion measures, the division also pursues the designers of malicious code through traditional law enforcement techniques. Smith, who grew up in Youngstown, became interested in pursuing computer science the summer before her sophomore year of high school. Her parents suggested it because she so enjoyed DigiGirlz, a Microsoft Technology Camp. Smith competes in the pole vault and javelin on Wright State’s track and field team. While at Wright State, Smith interned with the Air Force, working software programming and development. “I realized during that internship that I enjoyed coding, but it wasn’t something I could see myself doing for 40 hours a week until retirement,” she said. In the summer of 2017, she attended the Virtual Intelligence Community Fair sponsored by LinkedIn and was encouraged to apply for an FBI internship by a recruiter. “I realized law enforcement was something I was truly interested in,” she said. Jacquelyn Smith also competes in the pole vault and javelin on Wright State’s track and field team. During her FBI internship in Cleveland, Smith learned she is a workhorse and a leader in action, not word. She also learned she enjoys challenges and problem-solving. Smith’s supervisor encouraged her to explore the different opportunities in the FBI. 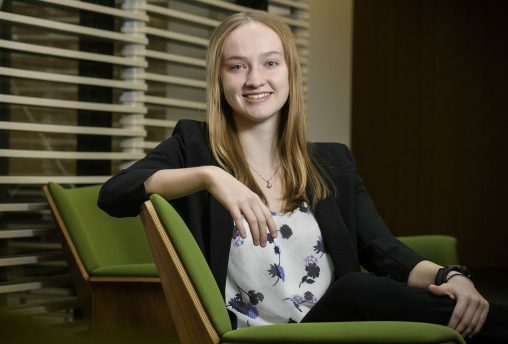 When she returned to Wright State in the fall, Smith added a minor in mathematics and a minor in statistics to her computer science major and is picking up a certification in cybersecurity analytics. 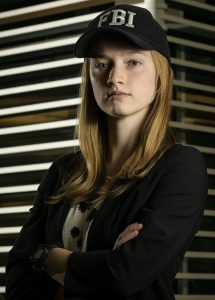 Smith is interested in a career job with the FBI as a computer scientist fighting network intrusions and malware or in digital forensics, which, for example, involves pulling information from cellphones used in crimes. The FBI is not the only law enforcement career on Smith’s radar. When she is not studying, Smith serves as president of Wright State’s Society of Women Engineers and vice president of Engineers Without Borders, a community service group that recently helped build a rain-collection system to irrigate a community garden in Trotwood and is helping create a wetlands observation deck in Fairborn. Over spring break, the group along with members of the Greater Cincinnati chapter of Engineers Without Borders will travel to the African nation of Uganda on a sanitation project for a school there.